This week, I absolutely loved starting the Superfood Nutrition Guide. Today I made the Berry Bliss Parfait for breakfast and it was SO good! The guide gave me a shopping list, step-by-step instructions, and even included photos of the finished recipe! 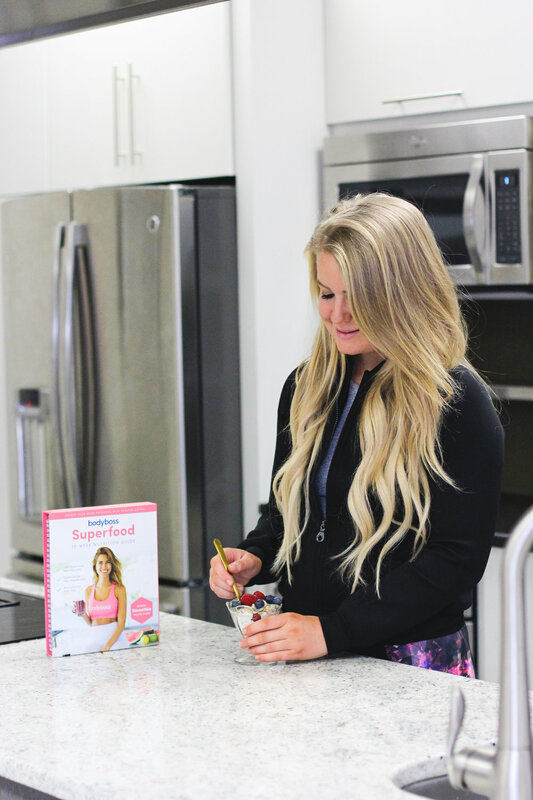 The BodyBoss Superfood Nutrition Guide is a 12-Week Nutrition Program that includes meal plans and nutritional tips so you can reach your health goals. Although it is a structured eating plan, it puts you in control of nourishing your body, beating cravings and achieving real results. The meal-by-meal plan includes 3 meals and 2 snacks daily that include nutrition-dense Superfoods, lean protein, healthy fats and wholesome carbs. There is over 150 satisfying and energizing recipes that taste great! With every Nutrition guide comes with a bonus post-workout recovery meals and snack guide that includes over 20 power-up smoothies and over 30 snacks. They even include kitchen hacks to make cooking easier and shopping lists that you can keep on hand! This nutrition guide even includes approved cheat meals suggestions so you can still live your life. Throughout the program, you will learn how to replace low- nutrient foods with better options so you will feel fuller for longer while nourishing your body. BodyBoss encourages you while on your journey by giving you nutritional tips! You learn how foods can satisfy, fuel and heal your body so you can establish smart eating habits for a long and healthy life. Every Nutrition Guide includes a worksheet so you can easily set your goals. Whether it be weight loss, body goals, or just wanting a way to track your progress while on the program – the Bodyboss worksheet is a great way to goal set while on the program. You can even share your results with the BodyBoss community so you can stay motivated! Every Nutrition Guide includes a worksheet so you can easily set your goals. Whether it be weight loss, body goals, or just wanting a way to track your progress while on the program – the Bodyboss worksheet is a great way to goal set while on the program. You can even share your results with the BodyBoss community so you can stay motivated! Combining the BodyBoss Superfood Nutrition and Ultimate Body Fitness Guides will really fast-track your results. It has made me become fitter, stronger and healthier than ever before! This is a sponsored post written by me on behalf of BodyBoss Method. Thank you for supporting the brands who support this blog! All opinions are my own. Looking to Take a Break from your Everyday Routine?